« Homepage / Gourmet / "Tastemakers on the Bayou: Café des Amis enlivens a friendly Cajun community"
Afew weeks ago, I had the pleasure of visiting Breaux Bridge with a friend who recently decided to buy a house and move there, after living in Miami for more than 30 years. We toured the town, peeked into shops, and stopped to dine at Café des Amis, where crawfish is folded into everything from chicken to cornbread and croissants. Locals start nursing spicy Bloody Marys on Saturday mornings as early as 7:30 am, when the doors swing open for the Zydeco breakfast that begins at 8 am featuring a live band that plays until noon. Around 300 people show up every Saturday to dance and dine at the 85-seat restaurant in downtown Breaux Bridge, known as the “crawfish capital of the world” for its annual May festival. Café des Amis is the hit of the town. 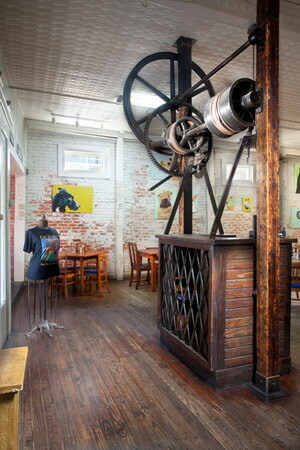 The cavernous restaurant with 20-foot-high pressed tin ceilings exhibits the works of local painters and sculptors who often congregate there. On any given evening, you may find a famous artist or musician sitting at one of the tables enjoying dinner, as celebrity sightings are common at this hot spot near Bayou Teche. Notable musicians, artists, and writers in addition to B&B owners and antique dealers have been relocating to quiet Breaux Bridge in recent years (the population was 8,100 per the 2010 census). This includes renowned culinary antique dealer and author Patrick Dunne of New Orleans. He opened a second Lucullus in Breaux Bridge after hurricane Katrina, drawing the interest of national and international media; Café des Amis has also attracted the interest of the national press in recent years. These relative newcomers are redefining a small community where everyone knows everyone, and the telephone directory is still filled with nicknames such as Nook, Tigre, Squirt, Corn Cob, and Pee Wee. “People keep moving here and the cultural revival keeps on growing,” notes Chef Roberthon. The owner of Café des Amis, Dickie Breaux, is a member of the Historic Preservation Society. He has played a major role in the preservation of historic buildings in the downtown area. The building that houses Café des Amis was constructed in 1890 and has served as a general store, a place to manufacture caskets, a women’s apparel shop, and an art studio. 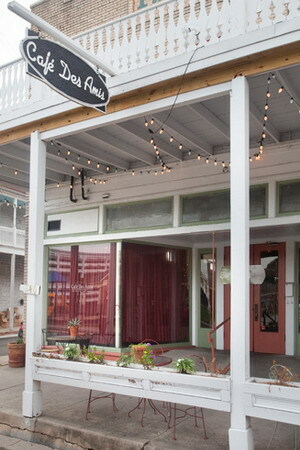 Breaux purchased the building and opened a coffee shop in 1992. As the demand for food grew, so did the menu, which is now quite extensive. The hand-cranked mechanism at the front of the restaurant was fashioned into a hostess stand by a local craftsman, and was originally the town’s first elevator. During the week, you can dine from 11 am until 9 pm and feast on an amazing array of Cajun delights. My friend and I stopped in at about 3 pm mid-week and ran into people we knew from Lafayette, to my surprise. On Wednesday nights there is live music, and the place is hopping from 7-9 pm. Locals gather at the beautiful black walnut and marble 1920s bar that came from the Evangeline hotel in Lafayette. Start with the superb BBQ shrimp Pont Breaux made with a house sauce that includes butter, Abita amber beer, and Worcestershire sauce, served with crostini. The lump crab cakes are also excellent, glossed with a smoked Vidalia onion sauce. Be sure to also place an order for the crawfish cornbread topped with crawfish étouffée. Chef Roberthon is an incredible, sophisticated cook who started working in restaurant kitchens when he was just 15 years old. Shrimp and grits is the most popular item for breakfast. “Jumbo shrimp are cooked in a tasso cream sauce and served on top of deep-fried grit cakes,” Chef Roberthon says. “Eggs Begnaud is also a big seller.” Grilled biscuits with crawfish étouffée are adorned by two eggs “your way.” You can also find an old Cajun favorite, couche couche, in addition to another classic, orielle de cochon stuffed with boudin. Sunday brunch was introduced one year ago, featuring the extensive breakfast menu in addition to various dinner offerings. Café des Amis, located at 140 East Bridge Street, is well worth visiting while in Cajun country. Check out the antique shops, open-air markets, and B&Bs while there. Lake Martin is five minutes away, filled with thousands of aquatic birds. The Bayou Teche Hunting Preserve opens October 1 for game, quail, and pheasant. Be sure to stop in at Champagne’s Bakery for their famous “pink cookies,” catch a jam session at the Coffee Break, and pick up some great boudin, hog’s head cheese, and homemade root beer at Bayou Boudin and Cracklin’ Café on your way out of town. 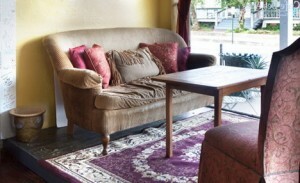 Here you can write a comment to the post "Tastemakers on the Bayou: Café des Amis enlivens a friendly Cajun community"